What are the top 100 most visited cities? There’s a list of them here compiled by research company Euromonitor International. They rank cities based on international arrival numbers so it’s as good a way to rank them as any. 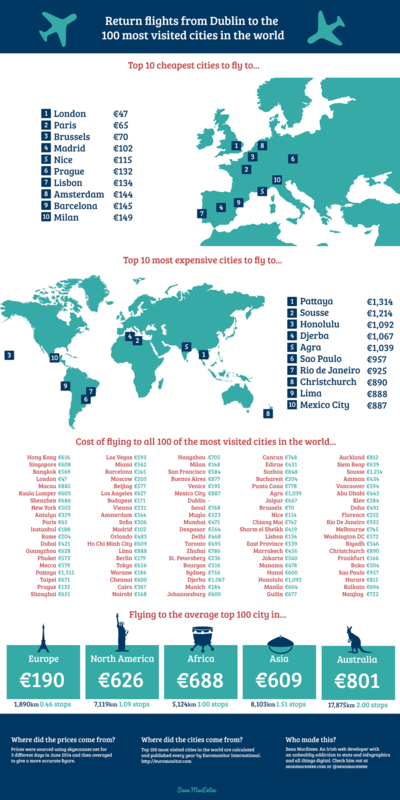 Dublin is ranked 47th on the list with a total of almost 3.1m arrivals. Hong Kong tops with list with almost 24m arrivals. The figures are based on statistics for the year 2012. I like to take things that bit further just for fun. What I ended up doing was calculating the distance from Dublin to all of these cities and figuring out what was the cheapest trip per kilometer travelled. I also wanted to see if there was any correlation between distance, price and whether a flight was direct or indirect (meaning multiple stops). For example does it work out cheaper per kilometer of travel to fly to Sydney than to Paris? These are just some questions I wanted to answer… and for the record, yes, getting to Sydney and Melbourne works out a 4c per kilometre… which is the lowest price per kilometre on the list. Getting to Paris works out at 8c per kilometre. Finally, i wanted to make sure i didn’t just ‘get lucky’ with a price on a particular trip / day, so I priced flights on a Tuesday, Thursday and Saturday in June, all returning within 7 days. I then averaged the price of all 3 trips to eliminate any abnormally low or high fares i might have stumbled upon had i just picked one date. Flights were priced using SkyScanner. Although spreadsheets can be beautiful, i know most people prefer to see something visual, highlighting key points instead. Conscious of that fact, i designed this beauty…. I’ve also made all the data I gathered available here on Google Docs. Do with it as you please.